My Harry Bryan plans arrived yesterday! I've figured out what I want to be when I grow up. I want to be Harry Bryan. Harry is a boatbuilder in Letete, New Brunswick, Canada, just across the border from Maine on the Bay of Fundy. This is a breathtakingly beautiful area of wooded, rocky coastline, crystal clear water and enormous tides. Harry lives off the grid, building wooden boats with a few alternatively-powered power tools and a bunch of hand tools. His philosophy is one of slowing down, going back to the land, making rather than buying, relying on yourself, your skills and ingenuity, and never stop learning. He's extremely inventive, combining traditional boatbuilding methods with creative solutions. Anybody for a treadle-powered bandsaw? It is an idyllic life, no doubt with its challenges, but he and his wife have succeeded, raising a family and enjoying time with their grandkids. The appeal and the draw of this life are powerful. I first heard of Harry when my daughter participated in a project at her high school to build his dory skiff Daisy. Now I find that there are a number of videos featuring him online (more about that below). Here are two that captured my imagination, Slowing Down, The Schmee of a Successful Man, and The Closest Thing to Magic – Of Boats and Boathouses. Harry is like Phil Lowe and Al Breed, what I call a shut-up-and-watch master of the craft. If you get a chance to spend time with them, you don't interrupt them, you just shut up and watch, absorbing the decades of knowledge and experience. Whatever they want to show you is well worth your time. I've finally succumbed to the lure of boatbuilding. I learned to sail in 2000, and became intrigued with small wooden boats in 2005 when I found John Gardner's Building Classic Small Craft: Complete Plans and Instructions for 47 Boats at the bookstore in Boothbay Harbor, ME. At the time we had recently bought a small vacation house close to the nearby Damariscotta River, where I kept a 23' O'Day sailboat that was built the year I graduated from high school (we had to sell the place in order to afford getting the kids through college, but we'll be back, count on it). I resisted the siren call to build my own for a long time, because I knew there was no going back. Everybody who knows someone with a boat knows what boat crazy is. But wooden boats, and building them, is a special kind of insanity. Why mess about with all that rigamarole when you can throw a sleek gel-coated fiberglass modern creation in the water? First of all, because, indeed, there is nothing - absolutely nothing - half so much worth doing as simply messing about in boats. Second, wood adds to that romance. The history of thousands of years is under you as you glide across the surface. Plus wood is such a wonderful material to work with, engaging all the senses. You become part of it. Finally, there's the pure satisfaction of using something you've made yourself with the skill of your own hands. Even the simplest boats are complex shapes. Building them is much more an exercise in hand tool work than power tools. Sure, there are dozens, if not hundreds of board feet of planking to get out and plane to thickness, and hundreds, if not thousands, of screws to drill and drive, so a benchtop planer and a power drill/driver are huge labor savers for very repetitive tasks. But most of it is handcrafting lines that are curving continuously and fitting parts that meet at odd compound angles. Even driving screws is worth completing with a brace and driver bit to give you that delicate feedback to know when they're seated just right. When you're done, you can enjoy the fruits of your labor in an intensely sensuous fashion. The Damariscotta River is a lovely small river that opens out to open ocean, with spectacularly gorgeous rocky, pine covered coastline. The tidal range in that area is a good 10'. That means it's actually a reversing river, flowing upriver on the rising tide, and downriver on the ebb. There's even a small reversing falls at the head of the river in the town of Damariscotta. This also means the river has many personalities, from a glass-still surface at slack tide, to a fast race when the downriver flow joins the tidal flow, to the chop and wild wind of a late November storm. You feel the power of nature, held in check or unleashed. Whether it's the mesmerizing burst and glide lazily pulling in a rowboat across the glassy river at slack tide, or the full heel of a sailboat close-hauled to the wind sluicing across the current, or a gentle drift from the head of the river down to the mouth after having sailed up beat on beat on the flood, you feel it with your whole body. You are joined with that power, harnessed to it in a vessel of your own making. First, of course, I need to learn how to build them. 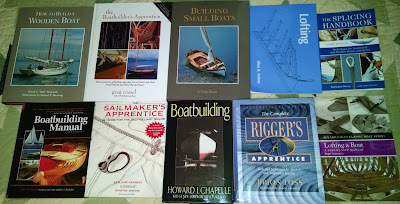 I've added significantly to my library with modern and classic books on wooden boatbuilding, rigging, and sailmaking from Amazon. You can also find supplies there, such as sailmaker's palms, needles, and thread. The Internet has also provided a vast treasure trove of articles, forums, and videos. I often watch videos at 1.5x or 2x speed. The YouTube player has a speed setting for this in Settings. The Vimeo player doesn't have a speed setting, but the unofficial Vimeo repeat and speed extension for Chrome works well, allowing any speed. There are many more to be explored, but three video sites in particular have caught my attention. First is OffCenterHarbor.com, an inexpensive membership site (it uses Vimeo for video when logged in, although some videos are also on YouTube). This is where I found the Harry Bryan videos. This was the tipping point for me, what tempted me to approach the black hole until I got sucked in. For this I can blame Al Hansen, from the Guild Of New Hampshire Woodworkers Boatbuilding subgroup. He recommended it at a Guild meeting where I was giving a demonstration on hand tool tag-teaming. OCH is filled with videos, some how-to, some just to drool over. It's headquartered in Brooklin, ME, about halfway between Boothbay and Harry's shop in Canada. They have a number of videos of Harry at work, explaining some of his nefarious devices and showing the boats he's designed and built. Based on these, I've ordered several plans from Harry, as well as for the Off Center Skiff. One of these will be my first build. Although there's also that Nutshell pram, that's cute. Auuuggghh! Second is Traditional Maritime Skills, the YouTube channel of Marcus Lewis, from Cornwall, UK. 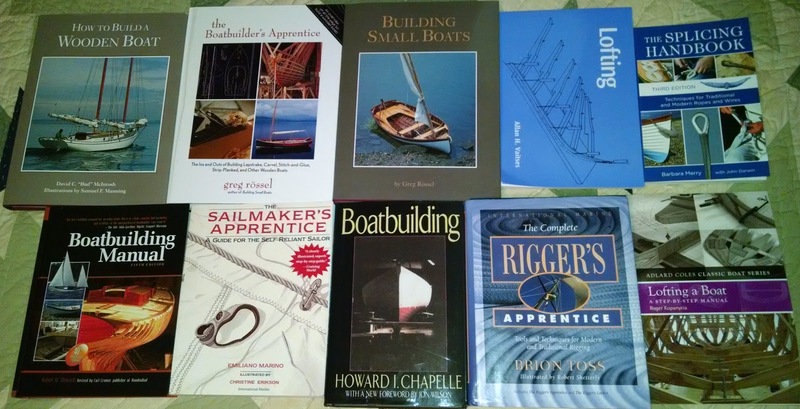 He has a variety of videos showing building small sailing dinghies up to larger sailboats. Third is Tips From A Shipwright, the YouTube channel of Louis Sauzedde, from North Kingstown, RI. Louis is another shut-up-and-watch guy, a short, wiry ball of energy, the living embodiment of the saying "When ships were wood and men were iron." In addition to a great series on a new build, he has lots of videos of restoration work. He doesn't hesitate to open up all the planking of a boat to fit in new frames, or unstitch the entire bow to replace the stem. You can read a nice article about him in the sample digital issue of WoodenBoat Magazine, entitled "A Modern Traditional Boatbuilder." In my online travels, I've come across a couple of schools. I'm sure there are many more. The WoodenBoat School is in Brooklin, ME. The Northwest School of Wooden Boatbuilding is in Port Hadlock, Washington. They have a very nice introductory video. 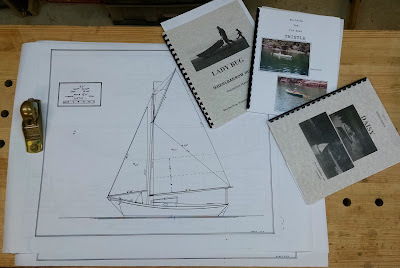 I like the philosophy of self-sufficiency and using boatbuilding as an approach to developing general hands-on skills, learning how to make anything. I've also found several suppliers. As with schools, I'm sure there are many more. WoodenBoat is the site dedicated to all things wooden boat. Browsing it is a sure sign of that slide into insanity. But what a glorious insanity it is! Jamestown Distributors is a family-run business in Bristol, RI, and is the sponsor for Louis Sauzedde's videos. They have parts, tools, adhesives, and finishes. Toplicht "Equipment for traditional ships and classic yachts, supplier for boat builders" in Hamburg, Germany. They appear to be a go-to supplier for all kinds of common and obscure fittings and supplies. They sell oakum! Duckworks Boat Builder's Supply is a small family-owned business in Port Townsend, WA. Their website includes an online magazine. Sailmaker's Supply is a small business in Gautier, Mississippi. R&W Rope’s Traditional Rigging & Outfitting Division is a family-owned business in New Bedford, MA. In addition to rope and traditional fittings, they also have caulking and splicing tools. Hamilton Marine is a regional boating supply chain along the Maine coast. West Marine is a national boating supply chain. Looks like you're really having fun now. Harry's designs are beautiful and oh so practical. I've built one of Harry's designs, the Fiddlehead canoe/kayak. Delightful to build and to use. I discovered one more supplier while spending time near the Wooden Boat School. Wander up to Liberty and find Liberty Tools, a paradise for those wanting old tools. I just made my first pilgrimage to Liberty Tools last weekend! Lots of good stuff. I have bought stuff from Toplicht, I can highly recommend them. Excellent and fast service. Always enjoy reading your posts, a very inspiring video to watch too is Shannon One Design filmed by David Shaw-Smith and his wife Sally in Ireland. Best of luck.